The great news about the best fly fishing reels in 2018 is there are plenty of fly reels to choose from at compelling price points. A fly fisher can now get into a well-made fly reel for less than $100 and sometimes even less than $50. Not only will these reels help you catch fish, they might even help you land the fish of a lifetime. So how do you choose the best fly fishing reel for under $100? Do you need the very best drag system? Is a large arbor important? Is the weight important? Is the kind of construction important? The real life answers are varied. If you want to know these answers, read on — and if you just want to get to the best fly reels for under $100, skip down. Meanwhile, the answers. So what does a fly fishing reel really do and where you need it to perform? You can get excellent performance from today’s entry-level fly reels. First, your fly reel is simply there to hold your fly line. That’s it. When you cast a fly rod, you strip line off of your reel and feed it into your back-and-forth casting action until you actually cast your line, leader, and fly out onto the water. Most of the time when you’re fishing, this line just sits in a pile at your feet, floats in the water around your legs, or you hold it in big loops with your non-casting hand. Then, when you first hook a fish, you strip this line back in with your hand in order to take all the slack out and keep your line tight to the fish. 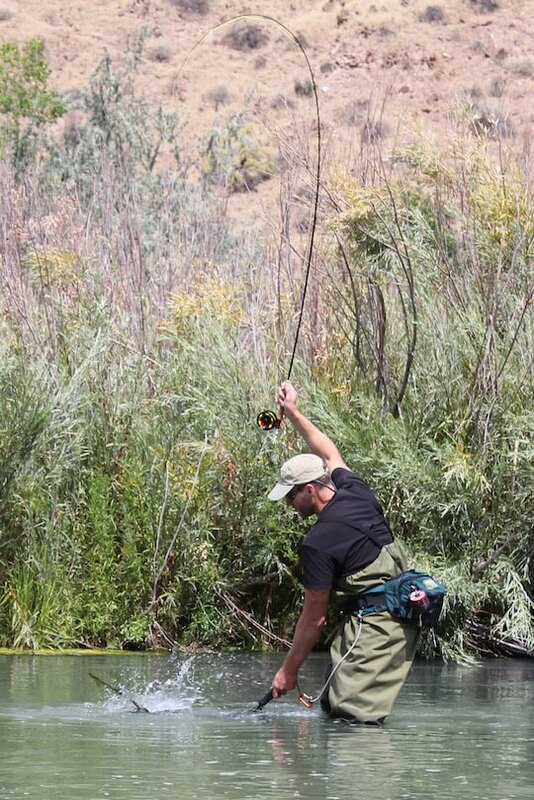 Once you are fighting a fish, you have a choice: strip the line in by hand or use the fly reel. 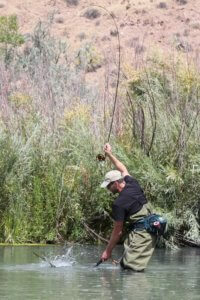 With most fish, especially freshwater trout, you can fight and land a fish without ever using your fly reel. Once the fish get bigger, it’s more fun to rapidly reel in all your slack line and start fighting the fish off of your fly reel. If the fish is really big or if your fly rod outfit is really lightweight, the trout will take off and strip line from your reel. And then you will reel it back in and maybe repeat the process. This is where your drag comes in. The drag is just a fancy friction setting that makes it harder for your fly line to exit your reel. Easy enough. The trouble is, cheap drags can stick or catch. If your drag sticks when your big fish takes off in a run, often times the light tippet at the end of your fly line will break. In this case, having a good drag is important . . . but is the answer found in spending $300-plus on a fly reel with a silky smooth drag? Not usually. Most fly fishers just can’t afford a fancy reel until they’re fighting a hard-core fly fishing addiction. What I always recommend is that you invest in a decent entry-level reel from a manufacturer with a brand name they stand behind. This means that you should ignore the cheap knockoffs. What you definitely want is a large arbor design that reduces line coil memory and lets you reel in faster. Next, you want to choose the right size of reel, so match the size to the weight of the fly line and fly rod you’re using. 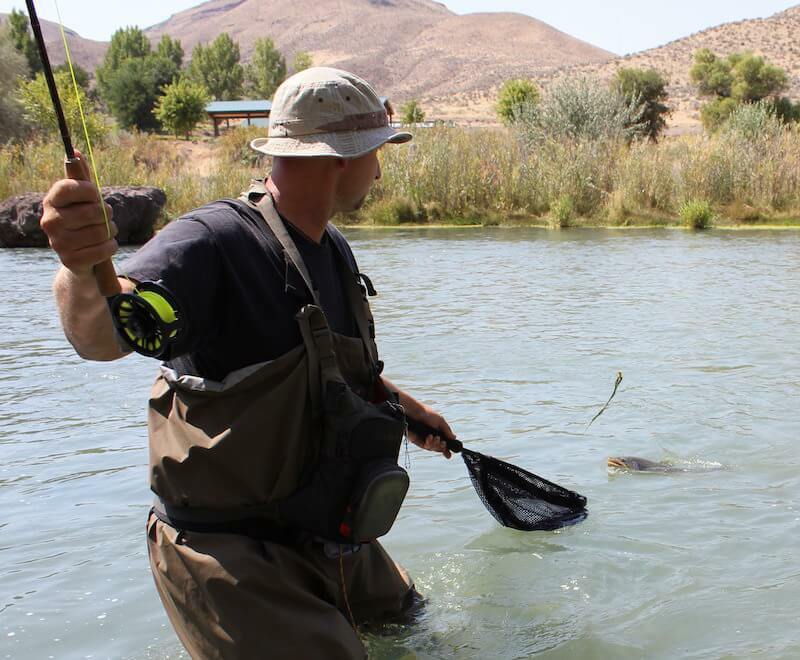 Most new fly fishers do well with 5 or 6-weight rods and reels. The Echo Ion helps handle a nice brown trout. Once you have a fly reel, the technique you will likely use is to set your drag a little lighter than you think you might need. If you do hook a monster fish, you’ll be able to slow the explosion by letting your fly line pass through your hands. When the fish continues and gets into the line on the reel, you want a smooth transition from your hand to the drag on the reel. If you set your drag too tightly, the fish will break off. Once you’re fighting a fish on the reel, you can always turn the drag knob a bit tighter based on the fishing conditions and the strength of your tippet. Or back it off. At the same time, most modern reels have a rim around the spool that you can cup with your hand to add a bit of drag if a fish takes off toward a submerged log. All of this is pretty easy once you get the hang of it, and what it really means is that you don’t have to spend a fortune on a reel to catch big fish. In fact, I’ve caught hard fighting coho salmon on a reel that costs less than $50. On the flip side, I always recommend choosing a decent reel that’s not going to fail or break and ruin your fishing trip. So invest wisely and you’ll have a great time. Shop fly reels at Fishwest and get free shipping on orders over $89! These are all excellent entry-level fly fishing reels that are fantastic for beginners — but are good enough to last years. Choose according to your budget and you can’t go wrong. The Waterworks-Lamson Liquid is the highest priced reel in this group — but it has two key sizes coming in under $100. Still, the price-to-value of this reel is hard to beat. Why? The Liquid uses the same highly-respected conical drag system used in Lamson’s premium reels. The major difference in the reel is its overall construction and manufacture. While higher-priced Lamson reels are manufactured completely in the United States, the Liquid is 50% manufactured in the United States, which, by the way, is far more U.S. manufacturing than any of the other reels in this class. So that’s cool. In addition, it’s completely assembled in Boise, Idaho. Also cool. What about function? The drag is fantastic at this price point, and overall, it’s just a great reel. If you want to add a splash of color, you can add orange, blue, or green colored sleeves that fit over the drag cassette. The Echo Ion has a wide-arbor design and a great drag. Echo is a company that produces quality-but-affordable fly rods and reels at price points that punch well above their weight. 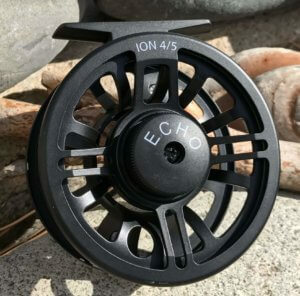 Echo’s Base Reel, which starts at $35 is a freaking steal, but the step up to Echo’s Ion Reel at around $80 just wins us over (just under $100 for the large sizes). Why? The Ion features a large arbor hybrid machined and cast aluminum design that’s tougher than most (plastic-like) composites. 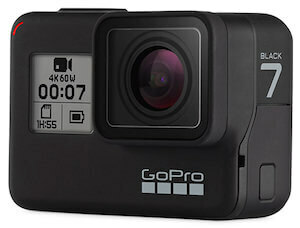 It has a maintenance-free rulon disc drag with a click position drag knob that inspires confidence when you adjust it. What about sizes? Echo offers a wide range of sizes from a 2/3 weight version on up to a 10/12 weight version. As we were reviewing the 4/5 Ion, it took a beating, including a skidding fall down a rocky bank — it took some scratches but kept on catching big brown trout. One last point for Echo fly reels: If you’re looking for a saltwater-safe entry-level fly reel, you’re going to have a spend a bit more, but the new Echo Bravo Fly Reel might be your best overall saltwater-safe entry-level buy. It’s hard not to like the Orvis Clearwater fly reel. It looks great, has a large easy-to-handle drag knob, has a good drag system, and it is just a competent reel in every respect. Orvis usually pairs this reel with its Clearwater Fly Rod and Reel Outfit, which is a also a great overall combo. The only downside to the Orvis Clearwater reel is that Orvis doesn’t sell extra spools available at a lower price. Why is that important? If you like to have a sinking fly line in addition to the standard weight-forward floating fly line that most people use most of the time, an extra spool lets you load a sinking line for easy switching on the water. 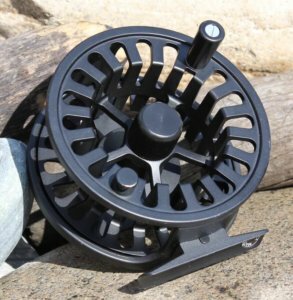 The Clearwater reel comes in just two sizes, which technically cover most needs: a 4-6 weight and a 7-9 weight version. 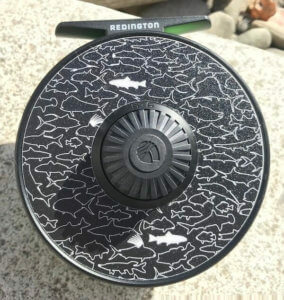 The Redington i.D Fly Reel lets you customize the reel with decals. The new Redington i.D. Fly Reel has a unique design feature: The flat black surface on the drag side accepts a wide-ranging line of decals you can use to customize the look of the reel. You can pick up these decals for $5 or so. You could choose a colorful brook trout skin pattern, for example, or even something statement-specific like “Keep Public Lands Public.” The fit and cut of these decals is spot-on, and the result looks better than we imagined. Meanwhile, the reel itself is an excellent entry-level reel. It has a strong and relatively lightweight cast-aluminum construction with a large-arbor design. The drag is surprisingly smooth — it’s a Rulon disc drag system with great adjustment for the price. Speaking of price, the Redington price is a bit over $100, but you can usually find it at third-party retailers for bit under $100. One nice feature is the dual-density handle, which offers a bit of cushion and is pretty grippy even when wet. 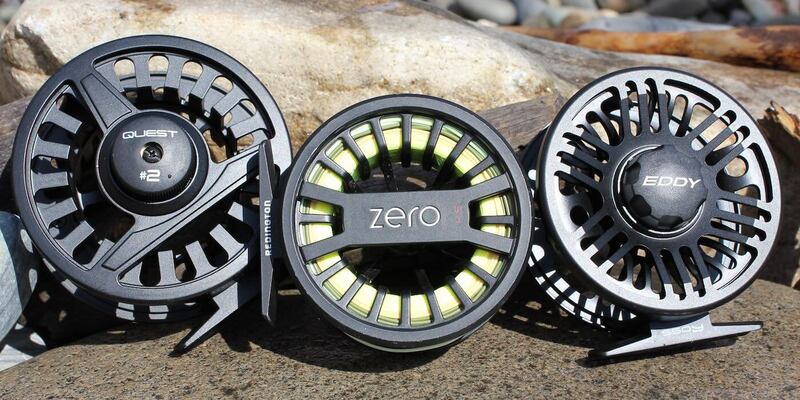 The Redington Zero is the lightest reel in its class. 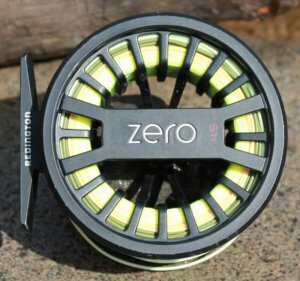 The Redington Zero is an interesting ultralight reel. It uses a die-cast construction to achieve one of the lightest reels available. For instance, the 4/5 version weighs just 3.0 ounces. 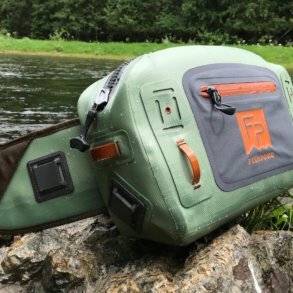 If you’re the kind of fly fisher whose arms get tired — or you’re trying to outfit a youngster — the lightweight Zero reel will certainly help. What about the overall function? To keep things light, the Zero doesn’t have an adjustable drag at all. It uses a clicker drag system with a little spring-loaded lever that clicks across gears on the spool. Is it good enough? It’s surprisingly effective. In our tests, it bested a hard-fighting 18-inch high-mountain rainbow trout on a backpacking trip . . . and then brought in a 21-inch plus bruiser that was twice the overall weight as the 18-incher. In addition to the standard Black version, Redington is offering a sweet Teal version — and that pop of color isn’t something you find very often in the best entry-level fly reels. 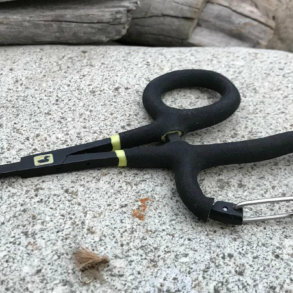 The L.L.Bean Quest offers strength for under $50. At around $50, the L.L.Bean Quest Large Arbor Fly Reel is a fantastic buy. It is strong, effective, and understated in its design. It arguably offers the best overall bang for your fly reel dollar. It feels good in the hand. Its rulon drag system is easily adjustable and smooth. We like it and we trust it. Are there any downsides? Sort of. The only downside is that it’s a bit heavier than the competition, which means that it’s not the best reel for kids who might not have a lot of arm strength yet. The #1 version is for 3-5 weight lines and weighs 6.1 ounces. It’s not bad, but if you’re looking for a 5-weight reel to pair with a 5-weight rod, you might want to choose the #1 version instead of the #2 version, which fits 5-7 weight lines and weighs 7.0 ounces. 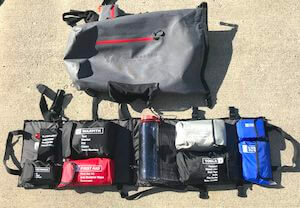 The #3 is for 7-9 weight lines and weighs 8.6 ounces. Oh, one more thing: The Quest comes with L.L.Bean’s legendary customer satisfaction guarantee. 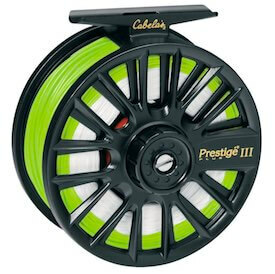 Cabela’s Prestige Plus Fly Reel. All-in-all, a beginning fly fisher on a budget can’t go wrong with any of these fly fishing reels. They all offer outstanding price-to-value ratios, and they will perform out on the water for you. For anyone on a budget who still wants a good experience, these are the fly fishing reels we recommend — seriously, try to ignore the cheap knockoffs. You’ll kick yourself if you end up losing a great fish or blowing out a fishing trip with a broken reel. If you are truly shaking the piggy bank, go with the Echo Base Fly Reel — at just under $35, it’s surprisingly tough and functional. What About Saltwater-Safe Entry-Level Fly Reels? 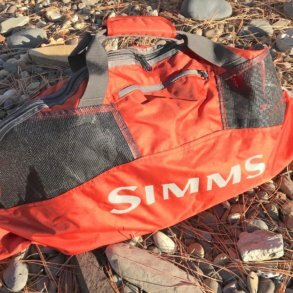 Saltwater can destroy gear, so you need to clean your fly fishing gear after fishing in the ocean — for example, thoroughly rinse it with freshwater. Even so, you need a reel designed for saltwater and sized right with a decent drag for powerful fish. Ideally, when it comes to reels, the standard recommendation is to use expensive fully-sealed drag systems on higher-end reels. However, if you’re looking for an entry-level saltwater-safe fly reel that won’t break the bank, check out Echo’s new Bravo Fly Reel. 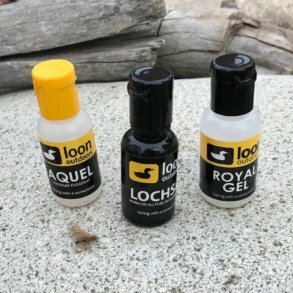 Need a Fly Line Recommendation? If you’re looking to add fly line to your reel, it’s hard to go wrong with the price-to-value ratio of the Orvis Clearwater Fly Line, which can usually be found for around $39. Sure, you can spend more on specialized lines, but the Clearwater will get the job done for 90% of the fishing that most all of us will ever do — and if you’re looking for entry-level, budget-friendly fly reels, the Clearwater line is your best all-around price-to-value bet.